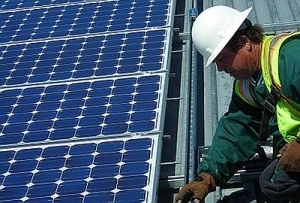 An insightful new editorial from Capitol Broadcasting Corporation says North Carolina lawmakers should take heed of the growing demand for a state-mandated rebate program for solar power users. The piece examines how the program’s popularity among consumers — Duke Energy received 2,000 applications over a two-day period this month — far exceeds the number of rebates that are available. Policy Watch’s Lisa Sorg has documented legislators’ reluctance to embrace clean energy programs, as well as the messy clean-up associated with the state’s not-so-clean energy production. Now, quite clearly, it’s time for state policymakers to approach clean energy with the same excitement as North Carolina businesses and residents. In just two days earlier this month Duke Energy received about 2,000 applications for a share of $10 million in rebates to North Carolina homeowners, businesses and non-profits to install rooftop solar power panels. That was way more applicants than money – about $10 million – available. In the second year, of a five-year, $62-million state-mandated program, the company expects to distribute more than 1,700 rebates. The program opened Jan. 2.By the end of the week the program was sold out… Last year, the first year of the program, it awarded about $8.5 million – more than 90 percent of the 1,700 rebates to homeowners. What’s the impact of the program? A year ago, there were 5,700 Duke rooftop solar customers. Today there are more than 9,000 – a nearly 60 percent increase. “Our rebates are driving solar adoption in the state,” said Duke spokesman Randy Wheeless. The rebates are significant – up to $6,000 for homeowners, $50,000 for businesses and $75,000 for non-profits such as faith-based facilities. The rebates are in addition to a federal tax credit of 30 percent (which drops to 26 percent in 2020). This program is a win all around. Electric power is generated without nuclear or fossil fuels. Consumers and the company avoid significant costs for both the fuel burned and the proper storage or disposal of the waste generated. No dealing with radioactive trash or toxic coal ash. Consumers both get a break on the cost of installing the solar panels and on their utility bill. Duke Energy increases its generating capacity without the significant investment of building new power plants. Public officials along with public and private energy generators and distributors should take notice and look for appropriate ways to encourage expanded residential use of renewable energy. Gov. Roy Cooper has noticed and has been leading efforts to grow the clean energy economy. Our legislative leaders have been out of step with both North Carolinians desires and our neighboring states energy policies. Virginia and South Carolina have looked to expand opportunities for solar capacity and offshore wind energy development while appropriately remaining highly skeptical at efforts to make our coastal waters open to fossil fuel exploration and development. North Carolina’s legislators have passed laws making it more difficult to deploy offshore wind energy – even though studies have shown the state has one of the best resources for it on the east coast. The federal Bureau of Ocean Energy Management has designated two areas off the state’s coast appropriate for wind energy development. These solar rebates were gone in a flash. It should be a bright signal to North Carolina policy makers. It is past time to expand opportunities to embrace renewable energy and put the state back on the road to national leadership in growing its clean energy economy. This is exactly right! On top of this, Duke Energy is doing in OTHER states what it won’t allow us to do: buy and sell electricity. What we need — and what South Carolina is moving forward on — is a Solar Bill of Rights. Why should Duke Energy tell us we can’t buy electricity from solar? What if Wal-Mart told us we couldn’t shop at Target or Costco, and passed a law that said so? This is what is happening in NC now, they are working on it https://www.thestate.com/latest-news/article208435464.html Of course, the major utilities are trying to kill it. This is why, despite the fact that clean energy is cheap, we have so little! Check out http://www.ncwarn.org, which has been trying (in vain) to get a simple hearing on its clean energy plan called Clean Path 2025. Seriously, folks, we don’t EVEN HAVE A DISCUSSION on these important matters. No hearing, no evidence given under oath, no discussion. You can’t even watch what’s going on over the internet. That is really terrible — no internet access in 2019? What is going on?